The new Climapac High Wall Twin Duct air conditioner from Powrmatic is a stylish yet fully integrated air conditioner and heat pump unit, with its own built-in evaporator and condenser. You no longer require external units and their associated refrigerant pipework. The Climapac features a distinctive, modern appearance, compared to more traditional high wall split systems, its polished black finish will fit in perfectly with any decor. 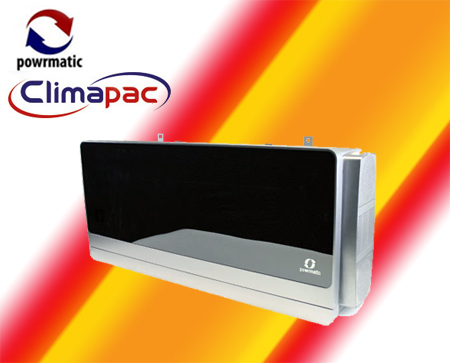 When mounted on an external wall, with discreet outside connections, the Climapac provides cooling, heating from a heat pump and supplementary heating from ‘speaker style’ PTC (positive temperature coefficient) ceramic heaters. The heating capacity is 2.23kW (3.86kW including ceramic heater), and the cooling capacity is 2.38kW and are fully remote controlled with temperature and timer options. A subtle simple to understand LCD display is conveniently located in the lower front panel. For more information about Powrmatic “Climapac” Air Conditioner / Heat Pump units call us on 01494 771211 or use our enquiry form.